The Anti 9-to-5 Guide » Roberta Browne, how’d you land that killer gig? Roberta Browne, how’d you land that killer gig? The job: Roberta Browne grew up on what she refers to as “a steady diet of Looney Tunes cartoons and ‘The Wonderful World of Disney.’” All her spare time in high school was spent drawing cartoon characters, all her notebooks were covered with doodles. After getting a commercial illustration degree at Ontario College of Art and Design in Toronto, she tried her hand at freelance illustration for two years — and wound up earning the bulk of her income by waitressing and bartending. Feeling off her game, she returned to school for animation and, upon graduating, landed her first job as an animator. 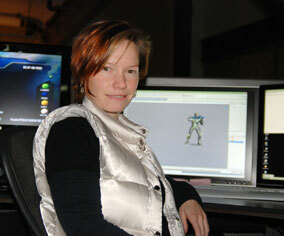 A decade later, in May of 2007, Browne joined Bungie Studios in Kirkland, Wash., where she works as a lead animator, a job that involves everything from 3-D software to brainstorming sessions to pratfalls. Q. How did you land your first game animation gig? A. I studied animation at Sheridan College, located in Oakville, Ontario. Every year the school would hold an open house to showcase the work of the graduating students. There was usually a big industry presence, with representatives ranging from small post-production shops to big movie houses to game companies from both Canada and the United States. After graduation I was offered a job at a small post-production house in Toronto, creating animations and effects for various TV shows. I was contacted a few months later by Broderbund, a game company located in the San Francisco area. One of their lead animators had attended the open house and seen my reel. I was offered a job. I have to admit, the initial draw of living in California overshadowed the opportunity to work in games. I wasn’t really sure what was involved in being a game animator, but I thought I could figure it out. What I discovered is that animating for games is an exciting, challenging and extremely rewarding job. Q. What does a lead animator do? A. My role has changed from creating animation content to managing. I oversee a team of five animators. Most of my time is spent planning, problem solving, coordinating with other functional groups and working with the animation team to ensure they have everything they need to create animation content. I sit with the animation team and participate in [their] reviews of content so far, brainstorming, and acting sessions. Acting sessions involve falling onto mats, jumping, punching and so on. We hand-animate, so there’s no motion-capture technology involved. We’re old school in that regard. I try to get in a little bit of animation here and there, but it is very limited. It was an interesting transition going from creating animation to helping others to create animation. But I have found it extremely satisfying. Q: How does game animation differ from film animation? A. Games are different than films in the sense that the animators create a bunch of smaller pieces of content that are then combined in the game engine. In film, animators work on shots or scenes and animate all the motion from start to finish. So a game animator needs to collaborate with other disciplines. That’s what I love about working in games — it takes art, design and engineering working together to fully realize and bring a game character to life. Q. Are you a gamer yourself? A. I do play games outside of work, about three to five hours a week. But I do not consider myself an avid gamer. My passion lies with animation and bringing characters to life. A lot of my free time is spent taking figure drawing and figure sculpting classes at a local art school. This keeps my observational eye sharp, which is a skill I use on a daily basis as an animator. Q. What advice can you offer hopeful animators? A. There are so many schools offering animation courses. My advice to those looking to pursue a career in animation is put your focus on learning how to animate. Many schools focus more on teaching different software, and it is fairly easy to get a character to move around. But to have that character act and emote is the real trick. Look for the schools that offer training in animation principles and acting. Having a solid understanding of the basic principles of animation and acting is the key to being a successful animator. Once you accomplish that, you can work in any area of animation production. You can read the rest of my Q&A with Roberta — complete with recommended resources for aspiring game animators — on NWjobs.com. Looks to me like she was always in the business and on track to achieve her goals, even when she waited tables. I don’t really see any it as any coincidence that she landed a killer gig eventually. Also, she is likely super talented and on par with whats expected in the industry. Not exactly somebody I feel sorry for or empathize with. She may have worked hard, but I don’t see any evidence of her encountering any real obstacles. Show me somebody who salved away working full-time in an unrelated field, while going to school for ten years and then landing a killer gig without family support or help from a large network of old friends. Now that would be a story! boo brings up an interesting point: that dedication, hard work, and talent will often rise to the top. agreed. also, no one ever said readers should feel sorry for roberta, and the Q&A doesn’t mention whether she did or didn’t come from priviledged or tough financial circumstances, so i’m not sure what boo’s getting at (other than trying to play devil’s advocate for the sake of stirring the pot). As I read the article I found that Roberta was not struggling in her career, but just in her ability to obtainfreelance work. Thats not really a struggle of how she made her career viable. It already was viable, just not doing freelance. The trouble is that she could have always gotten steady work in her chosen field doing the old 9-5, but she just thought freelance by itself was enough to get her by. It wasn’t. I don’t think she was ever in any really danger of failure or not being able to use her talents and costly education. But as you said I do agree that talent and hard work will get you somewhere. after reading the article(surprisingly and not surprisingly), i have the same response and feeling as boo, except that boo stated it better and explained it better. i guess as a certain type of reader and as someone who is drawn to this article/blog, i was looking/expecting something out of the norm, something un-ordinary, something not along the same trodden path that we usually hear about, especially when i saw the word struggle, i was looking for something more, something that you don’t hear about, something where a reader would say, so this is possible, there is hope. but having read the interview, she was pretty much in line with what she was meant to do and aimed at doing. although it is not your intent and i am being quite critical here, it is a good interview and i have gotten a good sense of what being a game animator is about. thank you. think you are all over thinking this, she achieved her goals by hard work & persiverance. Hope you canachieve the same.